Japan has one of the most advanced shipping and logistic facilities for handling motor cargos. Depending on the type of vessels, there are 2 main methods used for loading motor cargo. One type of cargo is known as Roll-on/Roll-off (RORO) and the other is container cargo. 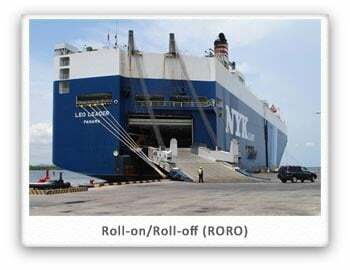 RORO ships are vessels that are designed to carry wheeled cargo such as automobiles, trucks, semi-trailer trucks, trailers or railroad cars that are driven on and off the ship on their own wheels. RORO vessels come with in-built ramps which allow the cargo to be efficiently grolled onh and grolled offh the vessel when in port. When using RORO vessels to ship vehicles, the customers will be charged by cubic meters depending on the destination. RORO types of vessels are currently facing shortage in supply as auto manufacturing increased globally throughout the past decade. The frequency of shipment for RORO types of cargo is lesser compared to container cargos and not every port is covered by RORO vessels, hence for many countries container cargo is the only available option to ship a vehicle. Container ships are cargo ships that carry their entire load in intermodal containers which is a technique also known as containerization. This method of shipment is one of the most common forms of commercial freight transportation. Shipping containers come in many different names, which can be a bit confusing. However most shipping containers are standard in shape, size and construction virtually throughout the world. 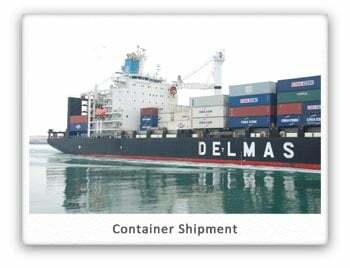 Containers are standardized re-sealable transportation boxes and the most common sizes used in ground and sea (surface) transportation are the twenty-footer and the forty-footer.